WE DON'T REST UNTIL YOU ARE DELIGHTED! 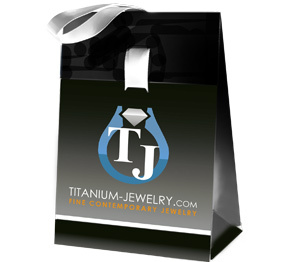 At Titanium-Jewelry.com, we strive to provide you with the very best selection, prices, and customer service. Unlike some other online stores, we are a real "bricks and mortar" jewelry store located in Modesto, CA with a GIA registered Gemologist on staff. We want you to be delighted with your new titanium jewelry! You can feel confident about your purchase of fine jewelry or gift items from Titanium-Jewelry.com. We try to accurately describe in detail every item we offer for sale. Because we use the highest quality materials and manufacturing techniques, thus insuring beautiful long lasting quality fine jewelry, we can stand behind every one of our products. If for some reason you are not totally satisfied with your purchase we will gladly accept its return within 30 DAYS of your receipt for exchange, credit or refund. Item must be in NEW CONDITION. We cannot accept items for return that have been worn, scratched, nicked, sized, engraved, worked on by a jeweler, altered or damaged in any way. Shipping charges are not refundable. If you are returning a ring for size exchange within 30 days of receipt, the ring must be in NEW condition. Please make a copy of your invoice and return with the ring. Make a note as to what size you need the new ring to be. There is no restocking fee, however, we do charge $20 for shipping and handling (or international shipping charges) on the second shipment. We allow for ONE free size exchange within the 30 days. We place an extremely high value on your privacy, and view it as a vital part of our service to you. We will not share your information with third parties. We are constantly working to improve our service to you and build a rewarding relationship with you. From time to time we may provide you with information about exciting new products and collections. Many of our customers have chosen to benefit from this information, and our hope is that you will also choose to participate. If you are not interested in participating, please contact us at 1-800-370-2646 or via email. Regardless of whether you choose to participate in our Customer Rewards program, we promise to preserve your privacy. We take security extremely seriously at Titanium-Jewelry.com. That is why we use the most up to date Web security technology to protect your personal information. Be assured that your credit card information is securely encrypted when you make a purchase. Once your order is processed, you will receive a confirmation email with your order information. If you would like to check the status of your order, please email us. While ordering online provides the most convenient way to purchase, we also invite you to call us at 1-800-370-2646 to place your order by telephone. Titanium and tungsten jewelry are covered by manufacturer warranty to insure that your jewelry stands the test of time. Please see the boxes below for details. Our titanium jewelry is guaranteed for 5 years! If a piece should EVER fail structurally, it will be replaced for only a $79 processing fee. We warranty diamond settings for on all titanium jewelry up to .35ct. Make sure to keep a copy of your invoice to take advantage of this guarantee. Return shipping charges do apply for international orders. Your new tungsten ring is guaranteed for 5 years! Scratch Proof Guarantee - Should your solid tungsten ring ever scratch, simply send it back to us for a replacement for only a $79 process fee. On two-tone tungsten rings we cannot guarantee the gold, silver or platinum inlays as they are softer metals. Return shipping charges do apply for international orders. **Proof of purchase necessary to qualify. Please keep your sales receipt as proof of purchase. Because titanium and tungsten are some of nature's hardest and strongest elements, you can rest assured that your new ring will continue to provide you comfort and enjoyment. By choosing a titanium or tungsten ring, you've selected the industry's new standard for excellence. By selecting one of our titanium or tungsten items, you've selected an eternal classic, noted for its enduring styling, quality craftsmanship and exclusive 5 year policy. When you receive your new ring from Titanium-Jewelry.com please keep a copy of your invoice in a safe location. Then relax, knowing that no matter how much your finger size changes over time, our 5 year size exchange plan will insure that your titanium or tungsten ring will always fit comfortably. Should you ever find your ring to be either too large or too tight due to fluctuation in finger size, simply return it to us along with a copy of your invoice. Our program will provide a replacement ring and your correct adjusted size. The exchange charge is $79.00 to cover the refurbishing fees, plus shipping and handling. All payments are due at the time of exchange. Hello and thank you for visiting our online titanium and tungsten jewelry store. We are jewelry professionals who have been dedicated to providing superior quality jewelry and personal service to our customers since 1988. We have a physical "bricks and mortar" jewelry store (Yates & Company Jewelers) located in Modesto, California. Here we offer custom fine jewelry with unique and original designs, antique and estate pieces and of course, a full line of incredible titanium and tungsten jewelry. Mechelle Yates is our staff Graduate Gemologist (G.I.A.) while J.R.(Ron) Yates handles many of the designing duties. Should you have any questions whatsoever, please email us or pick up the phone and give us a call. We always enjoy meeting our customers (whom we consider friends) and talking jewelry. Mechelle and I sincerely appreciate your business and look forward to developing a long term relationship with you. Thank you for supporting our family business. At this time we offer free shipping using United Parcel Services (UPS) 2 Day Air Service within the continental US for orders $100 and up. Most of our items ship within 5 business days. However, many of the tension set rings are made according to your finger size AFTER you place your order. For these please allow 2 - 4 weeks. To get a more accurate shipping time, please call or email us the item number and the finger size if necessary. If for some reason you are returning an item for exchange, such as exchanging a ring for one of a different size, there is a $20 shipping and handling fee. There is no restocking fee, however, if done within 30 days of receipt. After 30 days, size exchanges are covered by our exclusive 5 Year Size Exchange Plan. For International Rates please contact us. For items of high value we sometimes use U.S. REGISTERED MAIL with insurance. A signature is required for the receipt of all packages. Please allow up to 7 days for delivery of registered mail packages. We ship only to street addresses, not PO BOXES. For security reasons we ship to billing addresses. If for some reason you wish us to ship to your work or other address please notify us. We then will contact your credit card company and confirm that they have this alternate address on file. In this case you will need to make sure that this information is provided to your credit card company. Please inspect your package for damage or tampering BEFORE signing for it. We provide a free attractive gift box and gift bag to complement your purchase. We are confident that these will both enhance the beauty of your new titanium jewelry and assist you in a wonderful gift to that "someone special". We provide a free insurance appraisal on items over $500 on request. Please contact us via email or by phone at 1-800-370-2646 for more details on this offer. Click here if you want to return directly to the Titanium-Jewelry.com home page.